If you are looking for a diverse range of tremolo sounds, this may be for you. Lots of versatility. Solid build. Can connect expression pedal for more options. One of the more expensive in the Minifooger range. 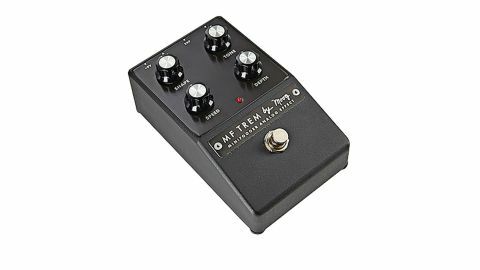 Moog's MF Trem is no simple tremolo pedal. While most tremolos will let you dial in the effect you want with speed and depth knobs, those knobs are not so straightforward here - there's a lot of interaction between them and the other two knobs. "This pedal is capable of many more sounds than a standard tremolo pedal, or an amp's built-in trem"
The depth knob, for example, increases depth for most of its travel, but doubles the trem speed when at its max position. A shape knob alters the waveform for a more lopsided throb, while the tone knob rolls back the treble content. The overall effect is that this pedal is capable of many more sounds than a standard tremolo pedal, or an amp's built-in trem. You can get those classic optical tremolo sounds, but also harder 'gated' on/off percussive trem. The expression pedal is assigned to speed, so you can get rotary speaker-like ramps and, with the speed knob set to full, even ring mod-style effects. A versatile tremolo for all seasons.